If you want to save a little money when remodeling your bathroom consider installing the bathroom vanity and countertop yourself. It is easy to do and requires just a few household tools. 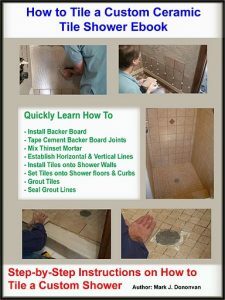 If you have basic DIY skills, along with a level, adjustable wrench, screwdriver, drill, jigsaw, caulk and some wooden shims you can install a bathroom vanity and countertop on your own in just a couple of hours. If you are replacing a bathroom vanity and countertop then you first need to remove the old one. Start by turning off water to the faucet. The shutoff valves should be located underneath the countertop. Next disconnect the flex supply lines from the shutoff valves, and separate the sink drain pipe from the P or J-trap located underneath the sink and in the vanity area. Now, using your screwdriver remove the corner screws that are holding the bathroom countertop to the vanity. It’s a bit of a tough squeeze doing this as you’ll have to lay on your back inside the vanity to reach up and get at the screws. Once the screws have been removed lift the countertop, along with the attached faucet, off the vanity and dispose of it. If you plan to re-use the old faucet disconnect it from the old countertop. However, I highly suggest using a new faucet since you’re spending the time and money installing a new vanity and countertop. If you are planning to use a new faucet, just make sure to select one that fits the number of hole openings in the new countertop. Standard bathroom countertops come with anywhere from one to three holes in them. After disposing of the countertop use your screw driver to remove the screws that are holding the bathroom vanity to the wall. Note, a screwgun can speed up the process of removing these screws. With the screws removed from the back of the vanity slide the vanity away from the wall and dispose of it. Position the new vanity near the bathroom wall and where the old one use to reside. Then identify and mark the area on the back of the vanity where you’ll need to cut out an opening with a jigsaw to make room for the shutoff valves and drain pipe to slide through. Expect to cut an opening around 8” x 8” in size. Use a drill to create pilot holes on the periphery of the marked area and then cut out the opening with a jigsaw. After making the cutout in the back of the vanity slide the vanity in place against the bathroom wall. The shutoff valves and drain pipe should slide through the vanity opening. 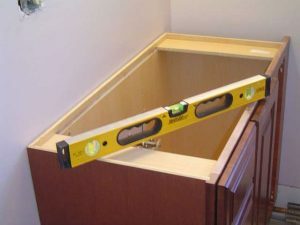 Use your level and wooden shims to make sure the top of the vanity is level and then secure it to the wall with screws. Screws should be place near the four corners of the vanity. Additional screws should also be installed near the top edge of the vanity, such that there is one every 16 inches along the back side of the vanity. Make sure, however, that the screws go into wall studs. Now it’s time to move on to the countertop installation. Start by mounting the new faucet to the countertop, and attaching the supply lines to the faucet stems penetrating through the back of the countertop openings. Then attach the sink bowl, unless the sink bowl is integrated into the countertop itself, to the countertop. Now attach the sink drain pipe to the bottom of the sink bowl. Next, on the top edge of the vanity run a thin bead of caulk all around it. The caulk will help to ensure the countertop stays securely fastened to the vanity. Then carefully place the bathroom countertop onto the top of the vanity making an effort to minimize any sliding of it while positioning it into place. Once the countertop has been positioned into place secure the countertop to the vanity by screwing it into place. Note that there are usually corner wood blocks on the top corners of the vanity to enable you to fasten the countertop to the vanity. Make sure, however, to use screws that won’t penetrate the top surface of the vanity. With the countertop secured, next connect the faucet supply lines to the the shutoff valves. Then attach the sink drain pipe to the P or J-trap drainage pipe. Finally turn the shutoff valves to their ON position and check to see if the faucet operates properly. That’s all there is to installing a bathroom vanity and countertop!